Measure out the amount of food. If the back of the food bag says to feed ½ cup of food daily, make sure you are are using a measuring cup and not a one-liter Big Gulp from Seven Eleven! Weigh your cat every 2 weeks. The easiest way to weigh your cat at home is to weigh yourself, then weigh yourself while holding your cat. If your cat is still gaining weight while getting what is recommended on the bag of food, you should decrease the amount you are feeding by 10-20% until you start to see weight loss. If your cat starts to drive you crazy because you are not feeding him enough, you may need to pick a food with lower calories so you can feed him a bigger portion. Indoor or weight loss foods will have lower calories. If possible, feed your cat small, frequent meals. Wild cats eat by foraging for small prey animals. Their stomachs are designed to eat this way. If you can split up the recommended daily food intake into 3 or more small meals, this will help them feel fuller for longer. One of the most effective ways to help cats lose weight is to add wet food to their diet. It seems counter intuitive but cats feel full based on the weight of food in their stomachs, not necessarily the size. Because wet food is heavier, they feel fuller and eat less. Be sure to cut back on the dry food if you are adding in wet. 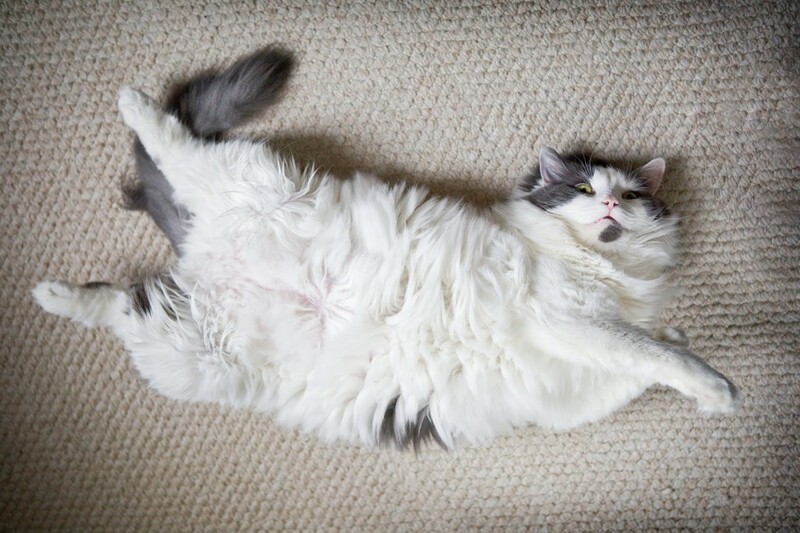 Lastly, just like people, exercise is critical for weight loss in cats. Cat toys, like feathers on the end of a string, can tap into a cat’s predatory instincts and encourage them to run and jump when they would otherwise be lying around. I hope these tips help your cat shed a few pounds in 2019. Happy New Year! 91 queries in 1.125 seconds.